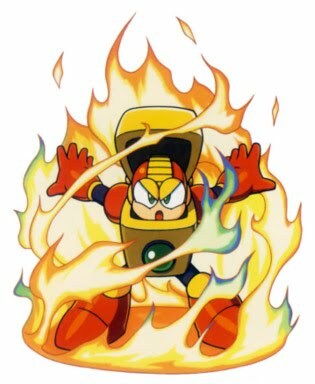 Another bit from the “cloudbush” thread: Heat Man, the boss from Mega Man 2 with the fire-based attacks, was clearly modeled after a Zippo lighter. I never noticed this before and find it kind of amusing. 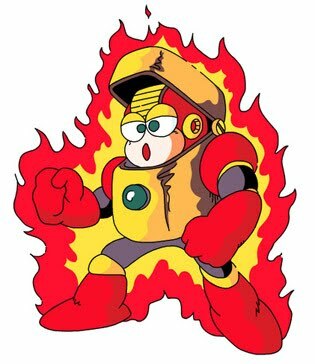 Furthermore, the arcade game Mega Man: The Power Battle, has unused animation frames that show Heat Man smoking. See also Golden Warrior Gold Lightan, the anime with the giant robot that transforms into a kid's pocket-sized gold Zippo. He smashes evil robots' hearts with a "golden hand stab" to the chest. Joe Camel's got nothing on this guy. Huh. Didn't know that and probably wouldn't have bet that there would be two Zippo lighter-robots in pop culture. How wrong I was. I was previously vaguely familar with Lightan just from having read about Tatsunoko vs. Capcom, and now, yes, I must admit that it's too bad he and Heat Man came so close to duking it out and deciding who was the mightier Zippo bot. I, for one, am guessing Lightan would win.